The commander of ISIS-K, the terror group’s offshoot in Afghanistan, was killed in a joint U.S.-Afghan special-forces raid last month, both Pentagon and Afghan officials confirmed. The April 27 operation, in the eastern province of Nangarhar near the border with Pakistan, took out the leader, Abdul Hasib, and at least 35 other ISIS militants. Hasib, a former Taliban member who switched allegiances, took over ISIS-K — which stands for Khorasan, an area that encompasses parts of modern-day Afghanistan and Pakistan — in July, after the previous leader, Hafiz Saeed Khan, was killed in a July air strike. Hasib still sowed chaos in his short tenure; officials believe he is behind a March attack on a Kabul military hospital, where ISIS detonated a suicide bomb as other militants dressed as doctors stormed the facility, killing about 50 people. Two American Army rangers were also killed in the April raid. The Pentagon is investigating the cause of their deaths, though they may have been caught up in friendly fire; a three-hour gun battle erupted during the operation. Afghan and U.S. forces carried out the raid that killed Hasib in the same area where the U.S dropped a 22,000-pound MOAB bomb — the largest nonnuclear bomb — on a cave complex used by hundreds of ISIS fighters, killing nearly 100 militants. 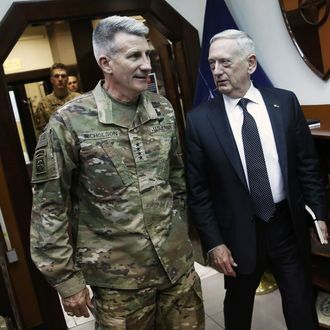 These operations come as U.S. and Afghan forces have stepped up the offensive against ISIS-K in the eastern part of the country following that March 8 attack. CBS News reports that a recent 24-hour bombing campaign killed dozens of fighters and destroyed a radio station that broadcast ISIS propaganda. The ongoing campaign against ISIS-K has reduced its ranks in Afghanistan — down to about 700 fighters from 3,000, reports the New York Times.